You can use keyboard shortcuts to do things on your Mac by pressing a combination of keys on your keyboard. To use a keyboard shortcut, press a modifier key at the same time as a character key. For example, pressing the Command key (it has a ⌘ symbol) and then the "c" key copies whatever is currently selected to the Clipboard. This is also known as the Command-C keyboard shortcut. You can see the keys that map to many shortcuts by looking in an app's menus. When the fn key is used with the top row of keys on your keyboard, it makes them perform a different function. For example, if a keyboard shortcut is Control-F2, you can press fn-Control-Brightness on your keyboard.. If you look closely at the Brightness key at the top of your keyboard, there is an F2 symbol indicating that this key works as a function ey (F2 or function 2) when you hold fn on the keyboard. If you use a non-Apple keyboard that includes a Windows key, the Alt key is the same thing as pressing Option, and the Windows key is the same thing as the Command key. 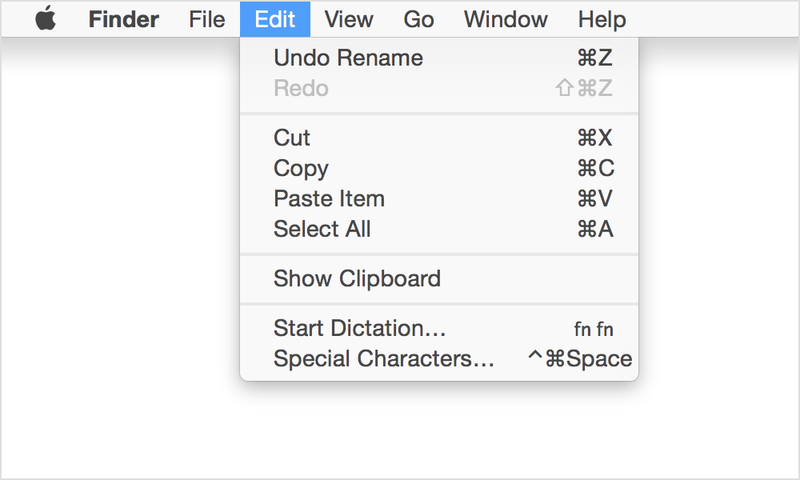 You can change how these keys are interpreted from the Keyboard pane of System Preferences. You can use these shortcuts in most apps to cut, copy, or paste a selected item. This includes text, pictures, music, and more. You can even copy and paste files in the Finder to copy them to a new location. Use these key combinations to change how your computer starts up. Press and hold the key or combination of keys immediately after starting your Mac until the expected function occurs or appears. For example, press and hold the Option key during startup until the Startup Manager appears. Note: If you're using a keyboard manufactured by someone other than Apple, the Alt key is usually the same key as the Option key. If this modifier doesn't appear to work, try using an Apple keyboard instead. Use these key combinations after your Mac has started up to sleep, shut down, log out of, or restart your computer. Power button Tap to power on. Once powered on, tap the power button to wake or sleep your Mac. These keyboard shortcuts work in most apps. Use these key combinations when editing text in a field or document. These keyboard shortcuts help you control your Mac with your keyboard or assistive devices. Some of these shortcuts need to be enabled in the Keyboard pane or Accessibility pane of System Preferences. Note: You may need to enable "Use all F1, F2, etc. keys as standard keys" in Keyboard preferences for the VoiceOver menu and utility to work. Full keyboard access lets you use your keyboard to navigate and interact with items on the screen. Use these shortcuts to select and adjust controls such as text fields and sliders. This setting can be toggled by pressing Control-F7, or by selecting Full Keyboard Access from the Shortcuts pane of Keyboard preferences in System Preferences. You can navigate the menus in the menu bar without using a mouse or trackpad. To put the focus in the menu bar, press Control-F2 (fn-Control-F2 on portable keyboards). Then use the key combinations listed below. When Mouse Keys is turned on in Accessibility preferences, you can use the keyboard or numeric keypad keys to move the mouse pointer. Command-C Copy selected files, then use Paste or Move to move the files. Command-V Paste copies of files you've placed on the clipboard to the current location. Command-Option-V Move the files you've placed on the clipboard from their original location to the current location. Command-Option-Y View a QuickLook slideshow of your selected files. To learn more about this feature of OS X, search the Help menu for "keyboard shortcuts". The following articles also provide information about keyboard shortcuts.